In the afternoon you will be accomodated to Hotel Villa Argentina***, which is in a sunny position with a superb view of Cortina’s mountains. 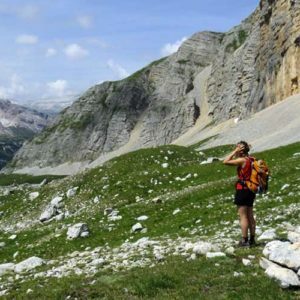 This is a reference point to all people who want to have an active vacation and the ideal location if you want to know the mountains in the summer. Departure after breakfast at 08:30 a.m. from Hotel Villa Argentina***. In the morning we will be facing two easy Via Ferratas (iron ways) called Ra Bujela and Astaldi. At lunch we will reach Dibona refuge hut. There we will have delicious appetizers, wonderful tagliolini (pasta) with a sauce of Mascarpone cheese, blueberries and speck. You can have a delicious second main course and you can taste their fantastic homemade cakes. After lunch we will keep going up the mountain trail from Dibona to Lagazuoi refuge hut through Sote Cordes and Col dei Bos. 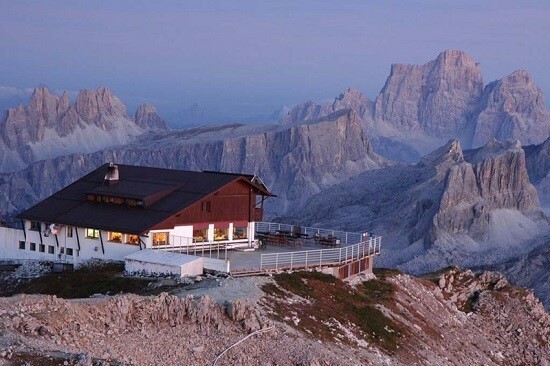 We will be spending the night at Lagazuoi refuge hut, where Guido and Alma will welcome you and make you feel like home even at 2700 m of altitude. The breathtaking view of sunset and sunrise from the refuge hut terrace will make you forget about the efforts of the day. After an early morning breakfast, at 08:30 a.m. we will be taking the trail through a gallery from World War One to Falzarego mountain pass. From there we will go by Limedes Lake to Averau refuge hut where will have lunch. Here you will taste their superb traditional appetizer, homemade Pasta main courses, a great second main course and finishing with a tasteful dessert. After lunch we will be going downhill to Bai dei Dones where you can head back to Cortina (transfer on request not included in the tour). 28th June, 12th and 26th July, 13th September 2019.